Memorial Day was agreed to have started in 1866 Waterloo, N.Y.
Arlington Cemetery he gave on Memorial Day 1902 while President. soldiers he addressed had fought in the Civil War. men and of the greatest crises in our history. There should be but few such holidays. To increase their number is to cheapen them. children s children were to inherit this fair land. and a quarter we have been a nation. would have meant not merely disaster but annihilation. much of the future of mankind as a whole. for you left us the memory of how it was achieved. This memorial day, attend your local memorial day remembrance. sacrifice by others before you. 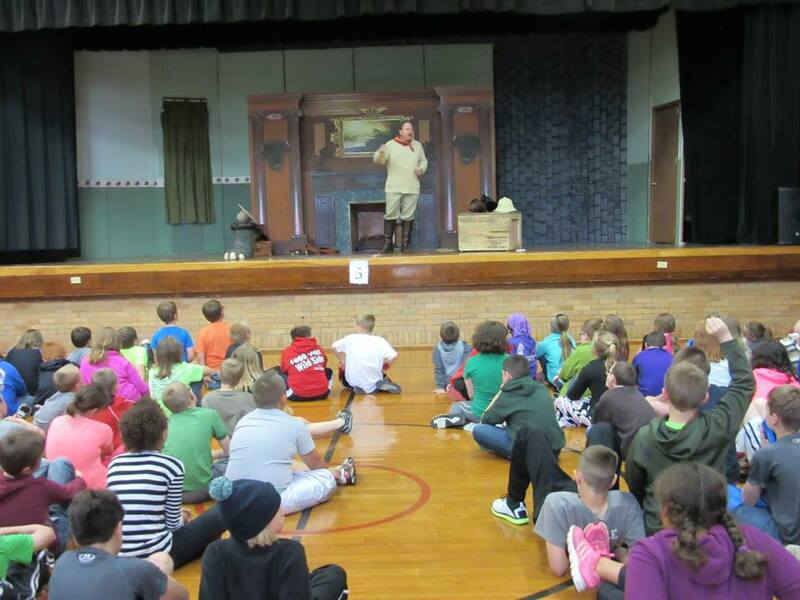 This past week I had the opportunity to present to hundreds of school children on Roosevelt in Iowa and Nebraska. While the programs I presented were very different in format and setting, the result was the same – the kids I met were eager to learn. My Iowa tour was sponsored by many local businesses for the children and adults in Albert City Iowa – a great town with an incredible Library, staff and volunteers who focus on creating cultural events for their community. The Nebraska event I presented was a outdoor expo, where kids get to try all sorts of activities to get them out into the great outdoors. Events included shooting guns, learning about animals, fishing, camping skills, kayaking and more. It was an amazing event and an important one to help increase utilization of parks and the great outdoors. I was brought into that event thanks to The Nebraska Game and Parks Commission and a grant from Nebraska Humanities. I presented there with my TR Camp. a reproduction of a Teddy Roosevelt hunting camp. In camp, kids get to immerse themselves in an 1880’s hunting camp experience to learn about conservation and hunting and it’s importance – from Roosevelt himself! They get a idea of what it was like to hunt with a President; what he brings and needs for a hunt and; to see and discuss animal skins he collected and what they are used for. I have done this camp for many years at history events with a very positive response, so I expanded the camp for 2015 and have been booked for a few outdoor expos. Like other events of this type, there are “School days” and “Public days”. On the first day after the kids had gone home, I was organizing my camp when a vehicle pulled up and a gentleman walked to my camp and introduced himself as a local elementary school Principal. He told me he stopped by the camp to visit because when his kids arrived back from the expo, he asked them to tell him their favorite activity at the expo. He expected shooting a shotgun or archery or another activity, but the majority of the kids told him they enjoyed their time with President Roosevelt. He just wanted me to know. I smiled a toothy Roosevelt grin as I shook his hand. I am not telling you this to impress you, I am telling you to impress upon you what I have learned as I have hone my skills in presenting as Roosevelt: Children crave to know things but they need a reason to want to know. They like hero’s and people they can relate. 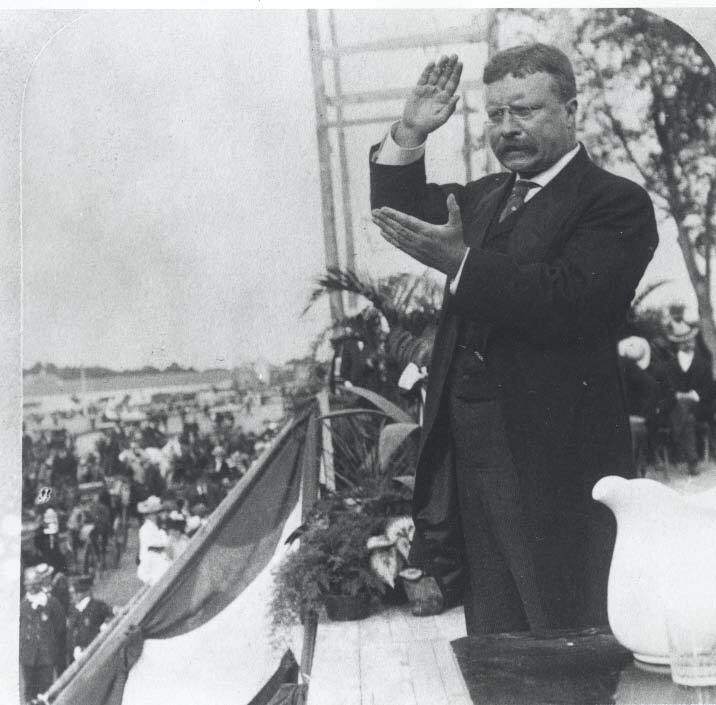 Children relate to Roosevelt because he overcame obstacles that they themselves face everyday. They want reassurance that even though a single day may be hard, that is just a small bump in the road. They want to know its alright to ask questions; to go on an adventure; to fail. They want to be part of something big – a shared place where they can have opportunity. They want what Roosevelt promised – by contributing their skills, they can be something incredibly special in all the world: they can be an American.